Get your infrastructure and applications cloud-ready. Fast. Our Application Services provide organisations with a platform where they can transform infrastructure and applications to be cloud-ready. Whether migrating to a managed or hyper-scale cloud environment, Trustmarque’s Application Services can accelerate your cloud adoption to meet any organisation’s unique regulatory, compliance and organisational needs. Why choose Trustmarque’s Application services? Our proven methodology for classifying, planning and transforming applications to the Cloud covers the whole lifecycle. We have extensive experience for both the public and private sectors customers in the design and delivery of successfully bespoke transformation programmes. Whether you’re reviewing your approach to application transformation or are looking for support in moving your applications to the cloud, our expert team of cloud consultants support organisations throughout their application modernisation and legacy integration journey. Trustmarque has a breadth and depth of experience with public and private sector clients in delivering successful bespoke applications and transformation programmes. Working with Microsoft for 30 years across a wide range of products and services has helped us build an experienced and knowledgeable team. Cloud computing: Are you getting the right support? Find out if you are, and how to get it if you’re not. 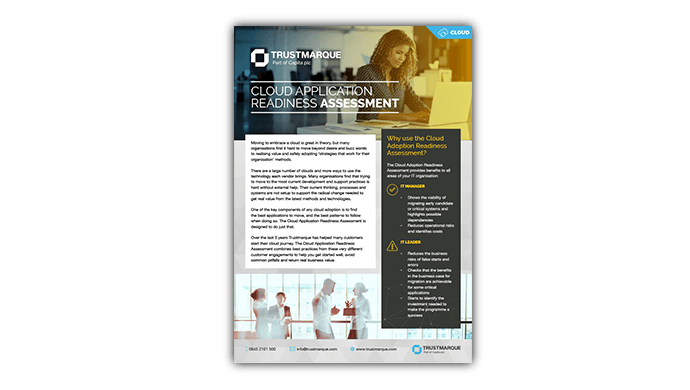 Trustmarque’s Cloud Application Readiness Assessment identifies how to modernise your application portfolio for a fast, predictable and cost-effective route to the Cloud. The assessment reveals the current state of your application estate, demonstrates the applications that will benefit from a move to cloud and defines the roadmap and best fit solution to pave the way for a successful migration. Why do you need a Cloud Application Readiness Assessment? Unlocking the business value from legacy applications can be a challenge for many organisations. With overly complex architectures that are costly to maintain, support and change, these applications no longer support the organisation to drive innovation from IT. Trustmarque’s Cloud Application Transformation service provides a personalised roadmap for application transformation. The service utilises the skills and expertise of Trustmarque’s application and cloud specialists who will guide you through your transformation from strategic planning, business case generation, architectural assurance and rapid agile delivery capability. We can migrate your applications to the cloud in a predictable and prescriptive way, using an agile (SCRUM) and DevOps based approach. Our Cloud Application Transformation approach includes tailoring and handing over architectural templates and processes for DevOps so that you can continue to realise the benefits of the Cloud for the longer term. 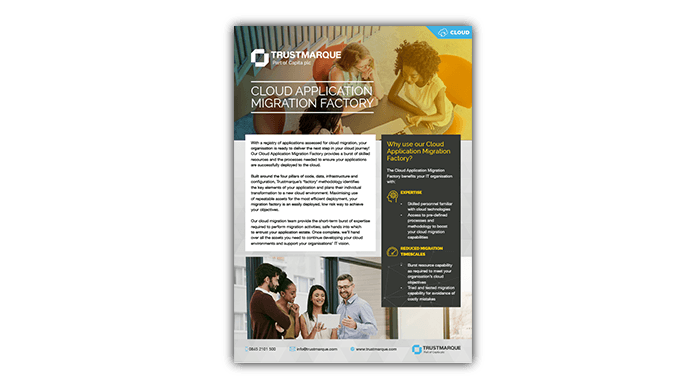 Trustmarque’s Cloud Application Migration team provides the skilled resources and processes needed to ensure your applications are successfully deployed to the cloud. 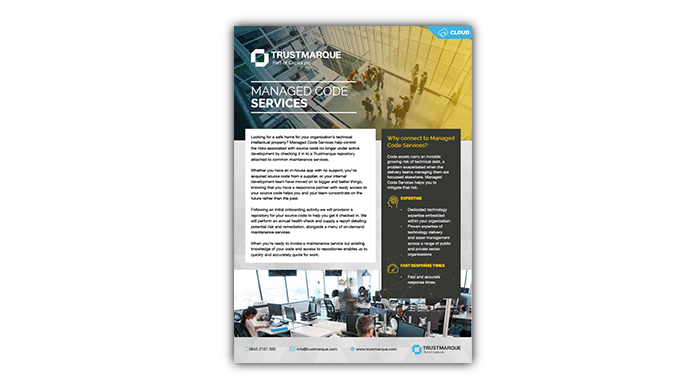 Built around the four pillars of: code; data; infrastructure and configuration, Trustmarque’s team helps identify the key elements of your application and helps plan their individual transformation to a new cloud environment. Our cloud migration team provide the short-term burst of expertise required to perform migration activities; safe hands into which to entrust your application estate. Once complete, we’ll hand over all the assets you need to continue developing your cloud environments and support your organisations’ IT vision. Managed Code Services help control the risks associated with source codes that are no longer under active development by checking it in to a Trustmarque repository attached to common maintenance services. Whether you have an in-house app with no support, you’ve acquired source code from a supplier, or your internal development team have moved on to bigger and better things, knowing that you have a responsive partner with ready access to your source code helps you and your team concentrate on the future rather than the past. Following an initial onboarding activity, we will provision a repository for your source code to help you get it checked in. We will perform an annual health check and supply a report detailing potential risk and remediation, alongside a menu of on-demand maintenance services. When you’re ready to invoke a maintenance service, our existing knowledge of your code and access to repositories enables us to quickly and accurately quote for work. Why connect to Trustmarque’s Managed Code Services?